Jolted back to reality by the presence of this reporter having been dozing off for what appeared the whole day, Lawal Azeez sprang to his feet to make enquiries about this reporter’s intended destination. Mr. Azeez was later joined by his colleagues, a group of old and middle-aged men. With desperation written boldly on their faces, they all scrambled amongst themselves to gain the attention of this reporter, whom they had erroneously identified as a potential passenger.. But the reporter’s response, detailing his mission at the park, would later dash their hope, and they all wobbled back to their respective positions, awaiting the arrival of another passenger. Mr. Azeez, 49, and his colleagues are taxi operators. But like others at the taxi park located around the Central Business District, CBD, Ikeja, their business has been disrupted by the activities of Uber operators. Uber is an internet-enabled, relatively stress-free transportation system that allows passengers order for cabs wherever they are at fairly cheaper cost. The system, which started around 2014, has been widely accepted by internet-savvy Nigerians who prefer it for comfort and safety purposes. “Ah, Uber people have spoilt business for us; I must confess,” said a disgruntled Mr. Azeez, when probed by PREMIUM TIMES. “To be frank, I didn’t make a kobo yesterday. These days, in a whole week, you may not get N5,000… which wasn’t the situation before now,” he lamented. When asked to give a rough estimate of how much he used to make daily before the alleged ‘disruption’ by Uber drivers, the Ogun State-born taxi driver said he couldn’t give an exact estimate. “But I know we make something in the region of ten-thousand plus daily on the average,” he said. Mr. Azeez’s position was corroborated by another Taxi operator at the Ikeja CBD, Hassan Murphy. Mr. Murphy, 43, explained that the activities of Uber drivers have been a source of sorrow for them as they no longer get patronage like they did in the past. “If you notice, there are many taxis on ground here and their owners aren’t here. They’ve all gone home out of anger,” he said. Mr. Murphy, who claimed to have built a house from his taxi transport business, also lamented that the development has taken a toll on his responsibilities among family members and at the home front. “These days, people I used to give N20,000 in the past would count themselves lucky if I give them N3,000. “It has become so bad here in this park that in a whole week, it may not get to your turn to pick up passengers,” he said. According to Messrs. Azeez and Murphy, although the business model adopted by Uber operators affects their business as taxi drivers, it is “reckless and unsustainable” even for the Uber operators. Explaining further, they noted that what Uber drivers charge their passengers as transport fare is “ridiculous”. “From here (CBD, Ikeja) to Maryland, Uber may charge N800,” said Mr. Murphy. “That’s nonsense. How do you maintain your big car and service it and realise what you will use to cater for yourself from that money? “For a trip to the Airport, they charge as low as N600 sometimes, while we charge N2,000 or N1,500. “See, let me tell you, unemployment is the reason people are into Uber. Ordinarily, the business is not sustainable,” he said. Mr. Azeez, on his part, agreed with his colleague, adding that many of the Uber operators are workers who got retrenched from companies due to the state of the economy. “Joblessness caused Uber, and it won’t last for long” he said. 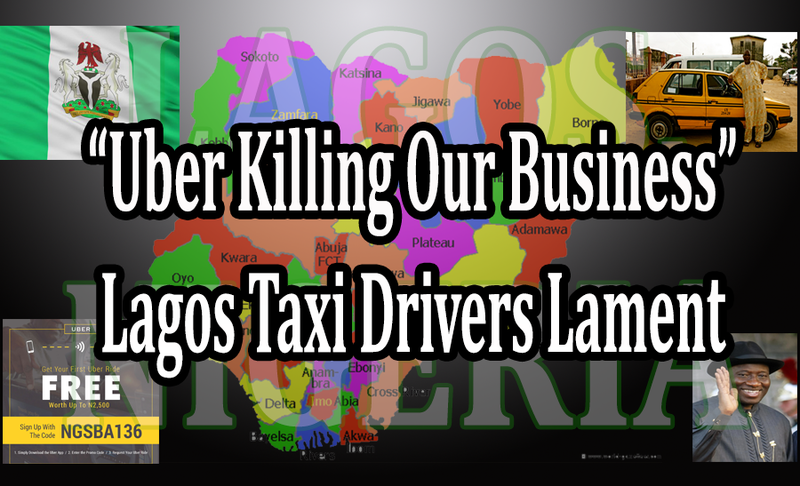 On his part, another taxi operator who identified himself simply as Baba Sanje, noted that Uber would soon fade into extinction, like other similar initiatives that came before it. “Uber met us on ground, they will leave us in the system. We have survived other similar competitors for decades. This ‘Yellow and Black’ (Lagos taxi) has nowhere to go,” he said in Yoruba. Speaking further, the taxi drivers told PREMIUM TIMES that their taxi system is more secure and safer for passengers than Uber. Citing a case of a passenger whose belonging was allegedly stolen by an Uber operator, Mr. Murphy explained that taxi drivers are more “loyal and trustworthy”. “Uber operators are ghost workers and they don’t have any union. Passengers don’t know them and you can’t even spot them from outside unlike us that have our ‘yellow and black’ identity,” he said. Mr. Azeez on his part added that Uber will soon fade away because, according to him, most of the operators are “running at a loss”. “Before Uber, there were Orange Cab, Easy Cab and Metro Taxi, they all folded up,” he said. “Yes, there also was Afro Cab… LSPC, RED cab, Easy Ride, Oga taxi… they folded up. Uber drivers, however, disagree with the assessment by the taxi operators. Charles Daniels, a Uber driver, dismissed the account of the taxi drivers, saying they were pained by the popularity and acceptability of the Uber system. “I won’t say Uber is really profitable, especially now, but it still provides food for some of us,” he said. Another Uber operator who declined to have his name in print, said in response to PREMIUM TIMES enquiry on how much they make: “You know, we charge very reasonable amount… so we don’t make huge figures like that… but it is something good… say thirty-something thousand naira or even more weekly. “That’s not too bad, I guess… and it still depends on days of the week and how energetic you are,” he added. Habeeb Adewale, 27, a regular user of Uber, who spoke with PREMIUM TIMES, explained that he prefers the system because of the ease it affords him to order for a cab wherever he is. “Wherever you are, Uber will locate you without stress,” said Mr. Adewale, a banker who lives and works in Lagos. Femi Owolabi, another Lagos-based passenger, said the system is cheaper and safer, especially for night crawlers. “Uber, preferably (because of) the comfort, and the timely service,” he told PREMIUM TIMES in an interview when asked about his preference. For James Abiola, an IT expert, the Uber system is preferable because of its cheaper cost and comfort. “Sometimes, Uber allows you comfortably ride an exotic car with less than a thousand naira,” he said, amid laughter. Okay folks, you won’t be seeing my face in this video, I am still in need of better lighting and a better camera. So you can enjoy listening to my beautiful voice for now. I must admit that I am a news junkie. I love the news! I love learning new things and I love leaning about people from all over the world. When this article came up in my news feed, I wanted to share it with my YouTube audience. As is normal for me, I like to take a moment to search for related articles and facts before I present the story to you. I also want to make sure that it is not just some story that is “fake news” and cannot be corroborated or substantiated. So I do a Google search on the articles I present. This particular article was quite interesting. Imagine, you ladies out there, having 38 children and starting at the young age of 13, your oldest child being 23. Even in the Monetary Capital of the World, the US, it is hard to fathom. Some folks have difficulty even getting pregnant and have to use artificial means to make it happen. Some folks are happy with one or two, but 38..?? What I found most interesting was the different perspective from the different media outlets who reported on this story. It seems to have been first posted in the the Uganda Daily Monitor where a reporter discovered this young woman and interviewed her. But little by little the details seem to take a tail spin and before long the story moves in several different directions that point to various controversies around child marriage, family relationships, paternal support, education, gynecology, maternal health, financial status and the amazing phenomenon of a woman who releases several eggs during ovulation. It’s a genetic rarity doctors say may have been passed down by her father who has produced 45 children with wives who have also had multiple births, yet the doctors said it would kill her to remove her uterus or give her a tubal ligation. Is this more cultural than medical perhaps? Others report she had an abusive husband who beat her if she disagreed with him. While on the other hand, the oldest child, a son says the children barely ever see their father, so… one wonders when the abuse occurred. Others point out how she works hard to feed them all and never have they missed a meal. So I will continue with a few excerpts from a few of the articles I found. Keep in mind that the original article from the Uganda Daily Monitor, is being quoted and in some cases embellished. That’s why I think it’s important to research a story for more insights and even perhaps get a little more info on the News Outlet and their reporters. Again the original report comes out of Uganda. 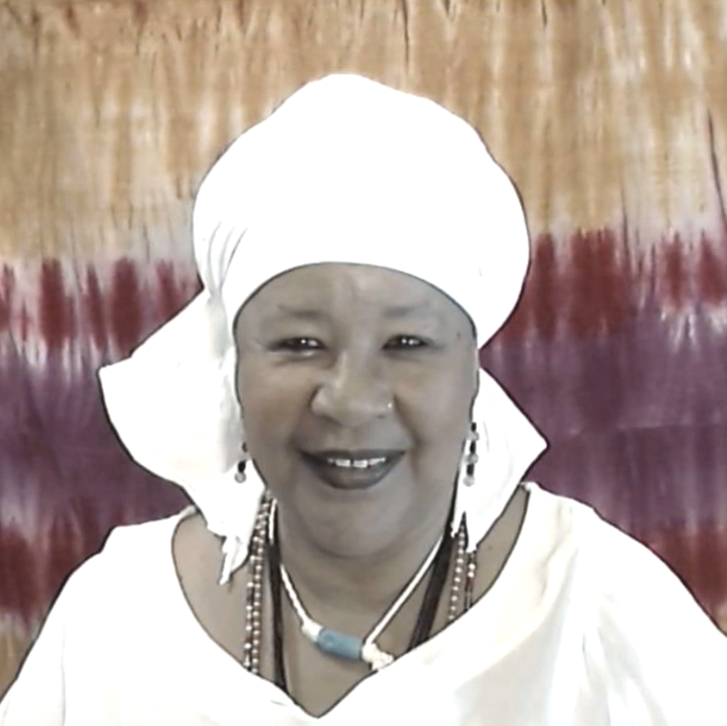 Mariam Nabatanzi. 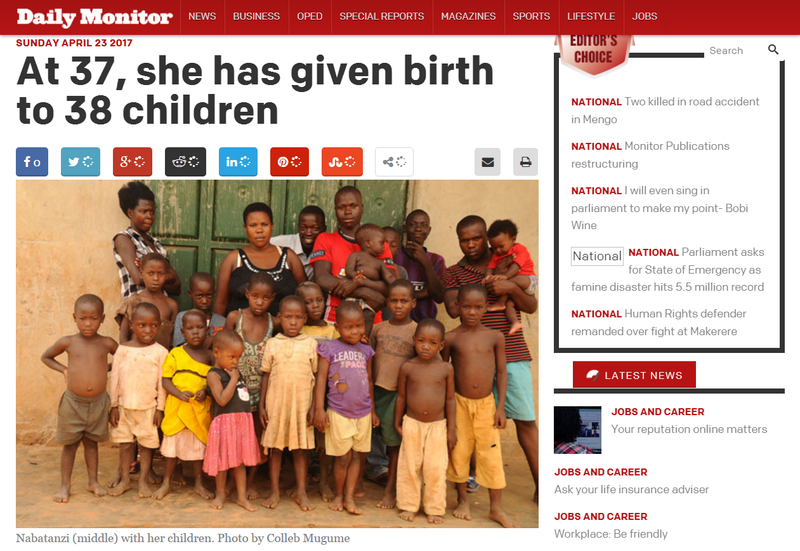 Although she planned to have only six children, by the time she had delivered thrice, she had accumulated 18 children and found out it wasn’t even up to her to stop when she wanted to stop. Where’s Oprah when you need her!!! The woman lives in Kabimbiri village, Mukono District in Uganda. She narrated her story to Uganda’s Daily Monitor and explained that she was married off to a 40-year-old man at age 12. Mariam sells herbal medicines for a living, something she has been doing since she was a young girl. Sometimes she does casual jobs such as hair plaiting and styling brides. “In an interview with reporters who discovered her, Babirye said her own father had 45 children from different women and the children came in multiple births. However, medical experts say Babirye is suffering from a rare genetic disorder which makes her pregnant very easily. Dr. Charles Kiggundu, a gynecologist at Mulago Hospital confirms that she may have taken after her father as her case may be genetic. 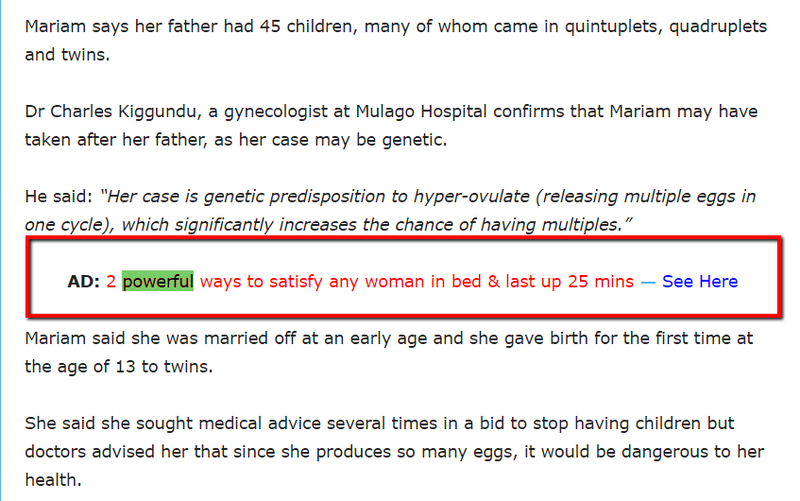 “Her case is a genetic predisposition to hyper-ovulate, that is releasing multiple eggs in one cycle, which significantly increases the chance of having multiples,” Dr. Kiggundu said. Babirye said she was married off at an early age and she gave birth for the first time at the age of 13 to a set of twins. She said she sought medical advice several times in a bid to stop having children but doctors advised her that since she produces so many eggs, it would be dangerous to her health. “My husband was polygamous with many children from his past relationships who I had to take care of because their mothers were scattered all over. He was also violent and would beat me at any opportunity he got even when I suggested an idea that he didn’t like,” she recalled to the publication. In 1994, only a year into her marriage and aged 13 she gave birth to twins. Two years later, she gave birth to triplets and a year and seven months after that added a set of quadruplets. 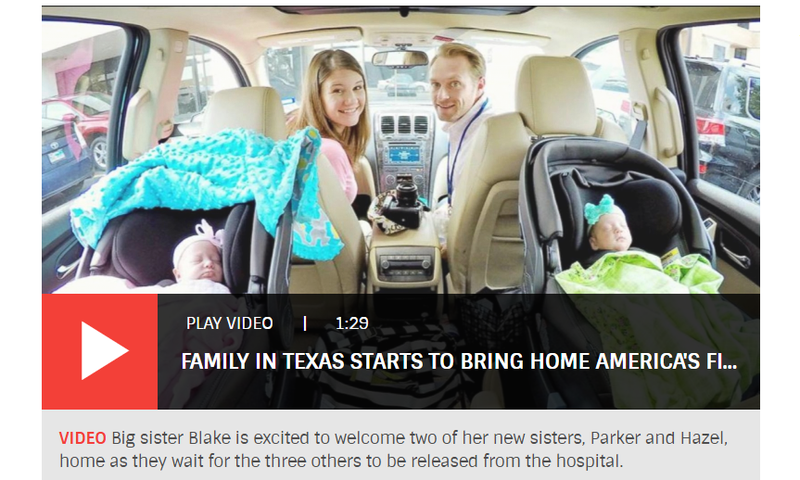 By her sixth delivery the mother had 18 children and wanted to stop. 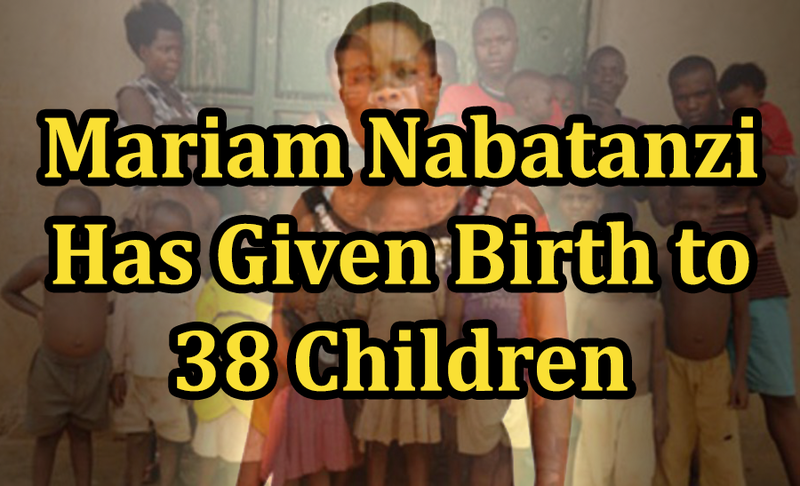 Nabatanzi was told by a doctor that she had an usually high ovary count. Right under that is this picture. Hmmmmm. Despite all the challenges she has suffered in her short life the mother of 38 is optimistic about seeing her children through school and making sure they are all educated properly. And then we get this right under this lady wanting her children to go to school but yeah…. You may want to rethink that. 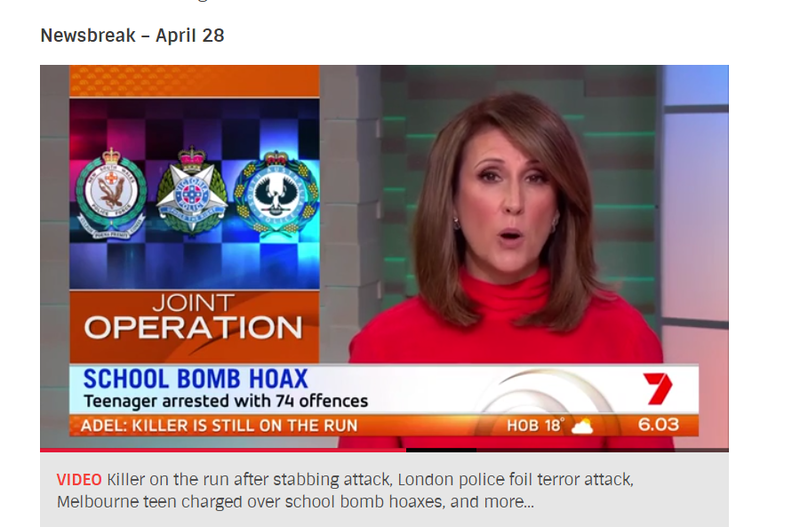 Yahoo7 News-School Bomb Hoax-Be Afraid, be very Afraid. “Being a child herself she told how she found married life at such a young age difficult. Does this story aligns with the Duggars? Does her story belong in the Guiness Book of Records, perhaps?